It is very important that as a patient, you choose a dental office that makes you feel relaxed and secure. 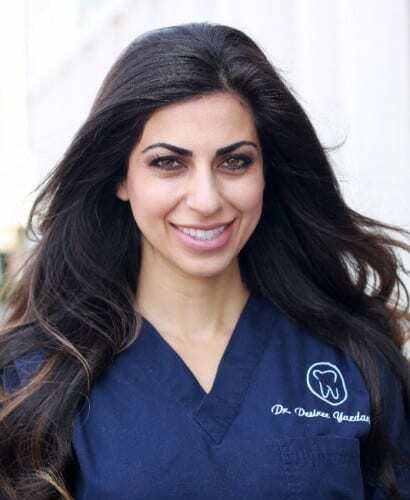 You can feel confident that our knowledgeable and caring specialists at Dr. Desiree Yazdan’s dental practice are focused on your best interests and strive to provide you with an outstanding experience. Our highly trained professionals have developed a comprehensive, prevention-oriented approach to our patient’s needs. We will select an optimal treatment plan that will perfectly match your unique dental needs and deliver superior results. Thorough and comprehensive dental exams usually include obtaining your dental history, taking diagnostic X-rays, oral cancer screening, an occlusal exam (to detect any tooth and jaw misalignments), a periodontal exam and more. Wisdom teeth extraction is the most common approach to treating and preventing various complications that are frequently caused by wisdom teeth. Durable tooth-colored fillings offered by our office in Newport Beach are used to restore the function and appearance of damaged teeth. Dental fillings bond to the tooth and strengthen its structure. Composite fillings, made of thin, tooth-colored resin that is superior to the old-fashioned fillings due of its durability, color and the ability to bond to the tooth. Porcelain fillings, made of an extremely hard ceramic material that is custom-molded to the shape of patient’s individual cavity. Fillings made of composite and porcelain are very sturdy and practically unnoticeable on the surface of a tooth. Dr. Yazdan primarily uses porcelain for the fillings performed in her office. Wisdom teeth are extremely susceptible to dental complications and can also be responsible for the damage to the neighboring teeth. Sometimes wisdom teeth problems develop without any noticeable symptoms. That’s why Dr. Yazdan’s cosmetic and reconstructive dental practice frequently performs wisdom teeth extraction. Wisdom teeth may be crooked or misaligned, resulting in bite problems, and they may be unable to grow out if there is not enough room in your jaw, which creates additional problems. Wisdom teeth are especially prone to decay. All of the above along with other reasons make wisdom teeth removal the most effective treatment for wisdom teeth. Dr. Desiree Yazdan’s philosophy focuses on conservation, restoration and prevention of tooth loss. Proper, regular care and professionally maintained dental hygiene combined with advanced dental reconstruction, allows our patients to enjoy complete dental health. There are many ways to avoid loss of teeth; however, in some cases the extraction may become inevitable. We realize that tooth removal may be a stressful event. That is why we are dedicated to making this procedure as comfortable for our patients as possible. Using state-of-the-art equipment and advanced techniques we ensure that our extractions are pain- and stress-free. Whether you are a professional athlete, weekend warrior or competing in school or intramural sports custom mouthguards will protect your teeth and make a statement about who you are.